Are you looking for ways to increase your traffic and subscribers? 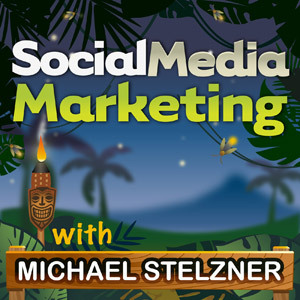 To explore how to grow your YouTube audience, I interview Steve Dotto for this episode of the Social Media Marketing podcast. 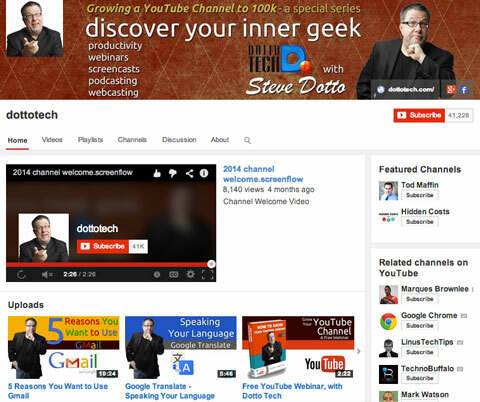 In this episode, I interview Steve Dotto, who produces Dotto Tech, a YouTube show designed to help you “discover your inner geek,” by focusing on productivity, apps and more. In his former life, Steve hosted Canada’s largest syndicated technology show of the same name where he entertained and informed millions of Canadians on all things tech. Steve’s also been involved with theater and comedy at Second City. Steve shares how he transitioned from hosting a tech TV show to a popular YouTube channel. 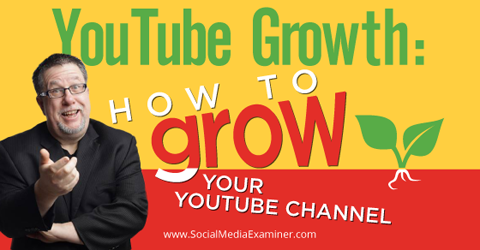 You’ll discover how to grow your YouTube channel. For 15 years, Steve had a popular TV series in Canada that focused on tech. According to Steve, toward the end of the run, the Internet was becoming more relevant and the show was becoming less relevant. So about four years ago, he pulled the plug on the TV show and then took some time to figure out his next step. He started to teach, dabbled on YouTube and did a radio show. Then at a conference two years ago in Victoria, he met Mari Smith, who introduced him to the world of Internet marketing and showed him how to build a community. Steve Dotto started focusing on his YouTube channel about a year ago. Steve took her advice and added his own approach. About a year ago, he really started focusing on YouTube. Listen to the show to hear how last year’s YouTube/Google+ changes were key for community development. Steve’s how-to series shows his viewers how to use tech tools—from Google functions to iPhone apps—more effectively. Steve says if you watch an episode and say, “I didn’t know I could do that,” “I’d like to do that” or “I should be doing that,” then he’s done his job. Most of Steve’s videos are between 5 and 12 minutes long, which is a little long by conventional YouTube wisdom. His goal is to take on a topic and teach his viewers something they probably didn’t know. Bottom line, he explains, is edutainment value. Listen to the show to hear an example of something Steve teaches during an episode. Steve feels that for many different topics it’s easier to convey a concept with inflection through video than on other platforms. It’s also a relaxing environment to browse through and discover information. Steve says most people will binge-watch YouTube. They’ll watch several videos in a row on the same topic to learn something. A video is easier to follow than a blog, it’s more engaging than a podcast and you can bring all of the media types together, Steve believes. Listen to the show to discover how Steve feels about writing. Steve sets his broadcasts up as screencasts, but uses an app so viewers can also see his face as he explains the tech. The why: Content creates a connection between the presenter and viewer. Whether it’s a blog, podcast or YouTube video, there is an intimate relationship between you, the speaker, and the audience. With the vastness of the Internet, Steve believes we often lose that personal engagement that happens when someone consumes our content. So we need to make every effort to develop that relationship. 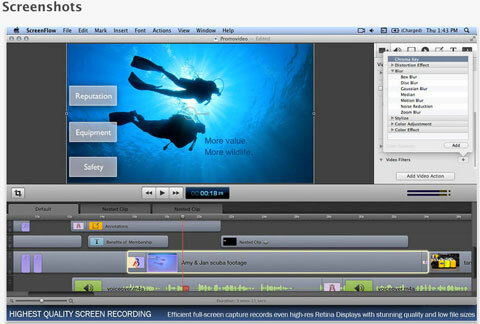 Steve uses ScreenFlow to edit his videos. The final piece of tech is a really good-quality audio setup. People will watch bad video with good audio, but they will not listen to good video with bad audio, Steve explains. Listen to the show to discover how Steve adjusts the camera, lighting and audio settings for his videos. Since we hear success stories of viral video hits, people think the only path to success on YouTube is quick, massive growth. That’s not true, Steve says. YouTube is like any social network. Apply the basics of social networking to YouTube, develop your audience and give it a try. Listen to the show to find out why consistency is the key to success. Steve decided to grow his YouTube channel during summer 2013, and made a commitment to publish at least one new piece of content each week (he has since increased it to two). The goal wasn’t to grow the channel; it was to see if he could build a business or livelihood with YouTube as his primary channel. Getting a YouTube subscriber is no different than getting a Facebook fan, Steve explains. When you post a new video, your subscribers will get a notification (although how they get that notification depends on their settings). Having a reasonable number of subscribers gives you social proof that you’re a player in your area of expertise. In 2 weeks, this video generated 5,719 views and 138 up votes. The main bonus: When you have subscribers, it creates a bit of momentum off the top when you post a new video. You’ll automatically get a certain number of plays in the first 24 hours, which is crucial for YouTube’s search engine. (It’s the second largest search engine in the world.) The key is getting your videos recommended when people are watching other videos. Steve’s channel began gaining ground when his videos started getting recommended, as people searched for keywords in videos he produced. Listen to the show to discover what percentage of views Steve gets from his videos being recommended. When he really started to develop his channel in September 2013, Steve had 4,000 or 5,000 subscribers. His first goal was to be at 10,000 subscribers by the end of 2013, and he hit it on December 29. He is currently at 40,000 and intends to pass 50,000 subscribers this year. At this level, he’s getting good traction. Steve just finished launching his first successful online course on Evernote. He did a product launch with a webinar and got a reasonable amount of sales from it. And a big part of the support came from that YouTube community he developed. For Steve, there’s little money to be made in advertising on YouTube. With 40,000 subscribers and around 180,000 views per month (which is just over 1 million minutes per month), Steve makes a little over $1,000 a month off AdSense. However, there are other revenue options like promoting products as mentioned above. There’s also a crowd funding website called Patreon, where people can ask their community to support them financially. Steve uses Patreon and gives incentives to viewers who contribute. This model also works for podcasters. Steve says the biggest difference between YouTube and network television is that when he was on TV, he never knew who his audience was, they just knew him. Now he knows his audience too. It’s smaller, shares Steve, but the members are his friends. Listen to the show to discover how Steve publishes and cross-promotes his videos. Hear how to grow your YouTube channel. Are you familiar with Skitch? Skitch is a cool screen capture and annotation application that you can use on your desktop or mobile device. It’s part of Evernote, and you can use it on Mac, Windows, Android or iPhone devices. Skitch lets you easily and quickly annote and markup images. Take a photo or a screen capture, and then use Skitch to call attention to something on it by drawing arrows or adding text on top of that picture. Use these images for a blog post or a social media update. The best part is that it’s integrated with Evernote, so your image will be available anywhere the program’s installed. Check out Steve Dotto’s review of Skitch. Listen to the show to learn more and let us know how Skitch works for you. This is our largest online event. It’s completely online, so no travel involved. There will be three sessions each day spread over an entire month. Each day has a theme, like deep dives into Google+, Facebook, LinkedIn and Twitter marketing. To help you do everything you could be doing with your social media marketing, we have some spectacular sessions lined up. We have more than 3,000 attendees from all over the world, from solopreneurs to some of the biggest brands in the world. Do you want to figure out how to best use YouTube, blogging, podcasting, Facebook, Pinterest, Google+, Instagram or any of the major social networks? Are you ready to take your social media efforts to the next level? Join us from the comfort of your home or office. 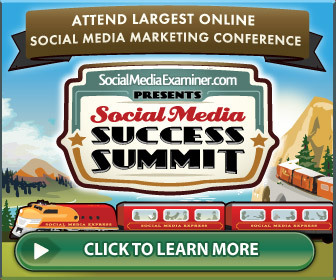 Our 45 Social Media Success Summit speakers include Jay Baer, Mari Smith, Mark Schaefer, Amy Porterfield, Bryan Kramer, Nichole Kelly, Pat Flynn, Lee Odden, Joe Pulizzi, Kim Garst, Martin Shervington, Neal Schaffer, Viveka von Rosen, Gideon Shalwick, Stanford Smith, Cliff Ravenscraft, John Lee Dumas, Sue B. Zimmerman, Andrea Vahl and Todd Wheatland. Check out Dotto Tech and sign up for the newsletter. 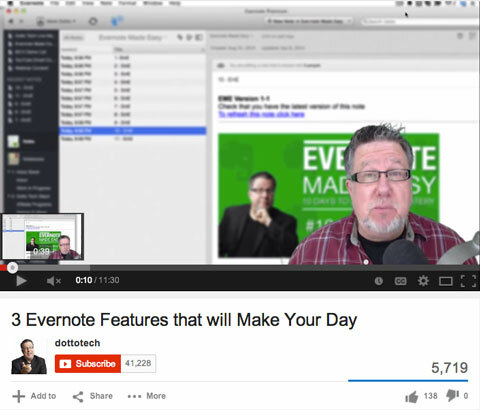 Learn about Steve’s courses: Evernote Made Easy and 3 Steps to Inbox Zero. Watch Steve’s videos on YouTube. Follow Dotto Tech on Facebook, Twitter and Google+. Listen to the Geek Life with Steve Dotto podcast. Learn about the funding platform Patreon. Check out items for your home video studio: Logitech c930e webcam, Webcam Settings app, CowboyStudio lighting kit, F.lux software, ScreenFlow and Chromakey Green Screen backdrop. Explore Skitch to add notes or emphasis to your photos. What do you think? Do you post videos? How do you interact with your subscribers? What sorts of tools and equipment do you use/recommend? Please leave your comments below.